“For the Elders” Coil Bracelet. $325. Indigenous cultures are built upon respect for the elders, for the wisdom and experience acquired over the course of a life well lived. With this coil, Wings pays tribute to the central role they play in our traditions, and to the lifeways that insist upon their honoring, in the materials and shapes and shades of our peoples and our ancient spirits. Each end is anchored by doughnut-shaped rondels of marbled and mottled fossilized dinosaur bone, extending into glossy lengths of fiery deep garnet, the deepest of the reds. Separating dark red from light is a strand of round opaque onyx orbs, followed by the dusky rose hues of rhodochrosite nuggets. 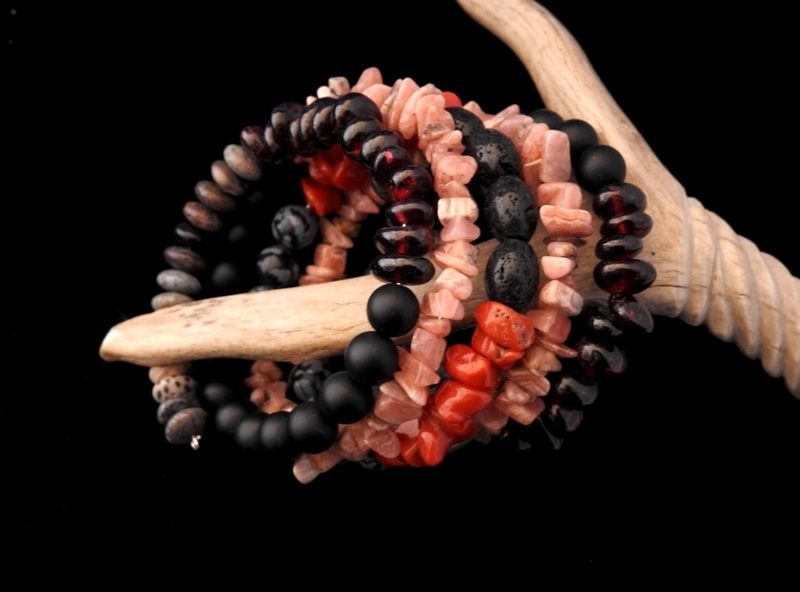 The pale reds give way to the black and white of fire and ice, snowflake obsidian spheres, each melding with freeform nuggets of Mediterranean coral in perfect flame-red crimson. The reds of the water spirits in turns flank a center strand of ancient earth,fire from below rising into the air to cool into basaltic lava rock, thence to become ovaled barrel beads formed of that most ancient of elders, Mother Earth. Sixth in The Respect Collection of The Seventh Fire Series. Designed jointly by Wings and Aji. All content, including photos and text, are copyright Wings and Aji, 2018; all rights reserved. Nothing herein may used or reproduced in any form without the express written permission of the owner. Posted on Friday, October 26th, 2018 at 4:47 pm. Filed under: The Coiled Power Collections, The Respect Collection, The Seventh Fire Series	RSS 2.0 feed. error: All content copyright Wings & Aji; all rights reserved. Copying or any other use prohibited without the express written consent of the owners.